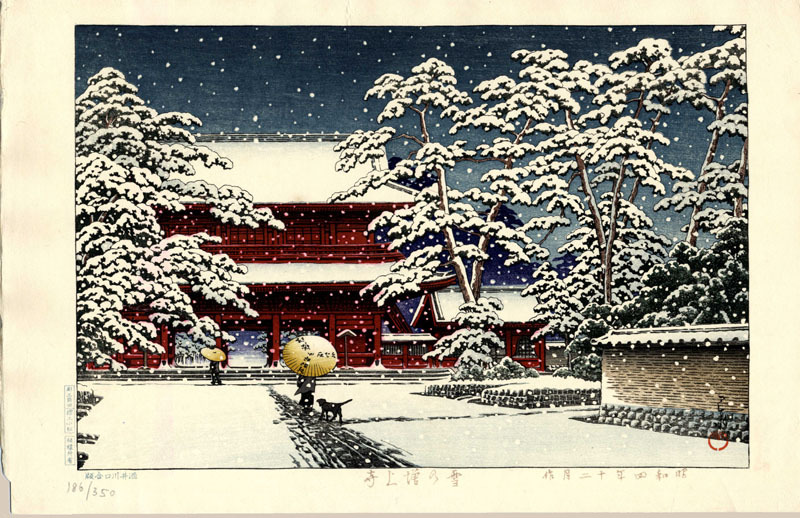 Hasui, Kawase (1883 - 1957), "Snow at Zojoji Temple"
11 x 17 -1/4 "
Notes: Near pristine example; never framed or displayed. Provenance: from The Robert Muller Collection - Pencil numbered by Muller; l.l. Removed from original folio and properly stored. Hasui signature and artist red seal, lower right. Left margin chops: Horiko [block-cutter], Maeda [Kentaro], Suriko [printer], Komatsu [Wasakichi]. Red limitation stamp in Kanji on the reverse. Stamped on the reverse, "Made in Japan", "17" (Publisher's catalog number) and "KAWAGUCHI". This is one of sixteen Hasui designs produced jointly by the Tokyo publishers Sakai-Kawaguchi in a limited edition printing. The overall quality of the joint publication was extremely high. Compared to prints issued by Watanabe Shozaburo, those of Sakai-Kawaguchi were typified by the use of a heavier, more absorbent paper, which was often larger in size, affording greater margins. Kawase Hasui, the eldest son of a merchant family, whose given name was "Bunjiro", tried his hand at running the family business, but turned it over to his younger sister and entered the studio of the artist Kiyokata at age 25. Kiyokata gave Hasui his artist's name in 1910. In 1916 he met the publisher Shozaburo Watanabe. In 1918 Hasui saw and was inspired by Ito Shinsui's "Eight Views of Lake Biwa" which were being shown at a Kyodokai exhibition. Hasui submitted sketches to Watanabe and so began the collaboration that started in 1918 and continued into the 1950s. While the majority of his prints were published by Watanabe, Hasui also worked with Kawaguchi/Sakai between 1929-1932. This later venture was a result of the artists' need to raise extra funds for the construction of a new home he was building in Magome. Hasui moved to Magome in 1930 and began what he described as his most interesting artistic period. Over half of his more than 600 prints were published during the period between 1930 to 1944. In 1930, with the help of Watanabe, Hasui exhibited 92 prints in the landmark Toledo Museum of Art exhibition, which introduced his works to the West and led to his international recognition as a Japanese landscape print artist. Later, Hasui was recognized for his ability to depict snow scenes. Great Japanese scholars like the eminent Naruzaki Mureshige liked to describe Kawase Hasui as the "Artist of Snow". He became one of the best known artists of the New Print movement and was named a Living National Treasure in 1956.